06.03.09	Who Wore It Better? 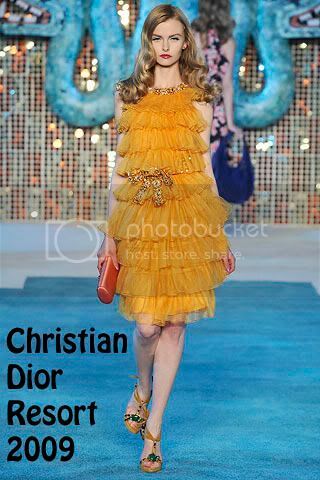 Katy Perry wore this Christian Dior Resort 2009 orange tiered dress, with embellished details to the Fashion Cares Fundraiser for the AIDS Committee of Toronto during November last year. The singer wore her dress with blue suede shoes, and a simple gold bracelet. Maribel Verdu wore the same dress 3 months later, when she attended the Goya Awards, which is the Spanish version of the Oscars. The Spanish actress wore her dress with an orange clutch and gold peep-toes. Maribel’s hair back, shows off the exquisite details, and her accessories worked better, so she wins this for me.